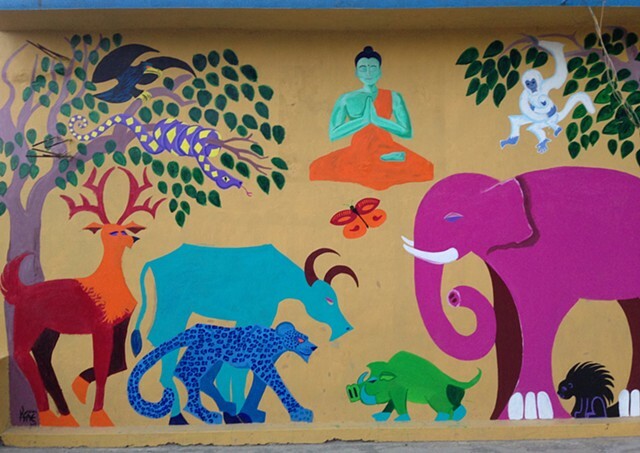 This mural is located at the Ashram Paryavaran Vidyalaya School a K-8 environmental education institution and meditation retreat center located in the Garhwal Himalayas of Northern India. This mural was orchestrated by Kwadwo Adae and executed over eight days in September 2015 with the assistance of the children and teachers of the APV School. Each grade was responsible for installing an animal in the mural. Funding for this mural was made possible through the generosity of people who donated to the Himalaya Mural Project, a crowdfunding campaign launched through Kickstarter which fully financed the cost of traveling to India, installing this mural, and donating art supplies.